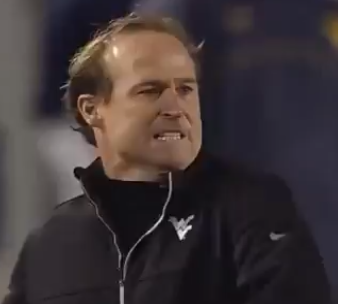 Everybody knows that West Virginia coach Dana Holgorsen is the prototypical "Mad Scientist" and an incredibly energetic and fiery guy. The guy loves to drink Red Bull and will frequently go nuts. Case A: late in third quarter, Holgorsen, irate after what he felt was a pass interference no-call, threw his headset a couple of times and proceeded to berate the referees. Good stuff, let's go to the videotape.